The Creatine has a proprietary GRO-CR3 creatine matrix combines three creatine types to significantly magnify the strength and muscle gains from resistance-training programs. This formulation also contains glycerol to help hydrate and supplement muscle growth. Take the Pre-Workout 5-20 minutes before exercising to significantly increase your energy and endurance for a more intense workout. 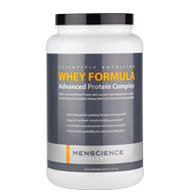 Add 1-2 servings per day of the Whey Formula to boost protein intake for muscle growth and fat loss. Why does this supplement contain three different types of creatine? How much muscle can I expect to gain while taking creatine? Creatine is an acid naturally produced in the body that supplies energy to cells for maximum muscle growth. It is synthesized from the amino acids L-arginine, glycine, and L-methionine. Most creatine (95%) in the body resides within skeletal muscle, while the rest (5%) is mainly found in the heart, brain and testes. Small amounts of creatine are also naturally present in meat. Creatine Workout Results Booster combines the benefits of three different types of creatine to maximize your strength gains. Creatine monohydrate is one of the most studied types of creatine and has been proven time and time again to be an effective workout booster. Creatine ethyl ester is another popular type of creatine that is absorbed faster than monohydrate and keeps bloating associated with water retention to a minimum. Magnesium creatine chelate pairs creatine and magnesium for greater bio-availability, ultimately resulting in higher concentrations of creatine in muscles. This creatine supplement also contains glycerol, which also helps the absorption process. Creatine typically requires a loading phase, an initial 5-day period where large amounts of creatine are ingested for the purpose of quickly loading your body's creatine reserves. This maximizes the availability of creatine for your muscles to use. Upon completion of the loading phase, you should only take creatine once daily after exercising. Creatine is just one factor in the muscle growth process, so individual results may vary. Other major factors include your diet, workout program and genetics. This product made me a stronger and better athlete. Unfortunately, it doesn't taste very good that's why I recommend mixing it with their post-workout product. Tastes amazing! this creatine really works in building muscle. I use this when I'm lifting weights. I feel it makes me stronger. Add one scoop to 3-4 oz. of cold water and mix well. During first five days of use (loading phase), take twice daily. After loading phase, take once daily after exercise. 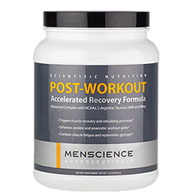 Use as part of MenScience Scientific Nutrition Program for best results.